This anaglyph made from images captured by NASA's Cassini spacecraft shows a dramatic, 3-D view of one of the deep fractures nicknamed "tiger stripes" on Saturn's moon Enceladus. The fractures, which are located near the moon's south pole, spray jets of water ice. Just below center in this image is an approximately 16-kilometer-long (10-mile-long) portion of the tiger stripe named Baghdad Sulcus. The Baghdad fracture is the longest of the four tiger stripes on Enceladus, with a length of 175 kilometers (108 miles). 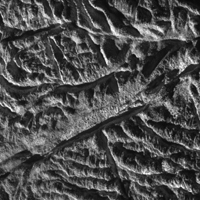 This image and others like it from the close flyby of Enceladus on Nov. 21, 2009, are among the best visible light images Cassini will capture of the tiger stripes before the moon's south polar region enters winter darkness for the coming years (see PIA11686 and PIA11688). Cassini scientists will use these new images to study geological activity associated with the tiger stripes and their effects on the surrounding terrain. This information, coupled with observations by Cassini's other instruments, will address the question of whether reservoirs of liquid water exist beneath the surface of the moon. See PIA11114 and PIA08386 to learn more. Details and surface relief presented in this anaglyph emphasize the youth of faulting on Baghdad Sulcus. Adjacent areas of more rounded topography are controlled by older faulting, compression or other factors. The 3-D view is a color composite picture made from two different black-and-white images that were obtained from slightly different viewing angles. The images are combined so that the viewer's left and right eye, respectively and separately, see a left and right image of the black-and-white stereo pair. The visually perceived vertical dimension can be exaggerated in this process. The sulcus is not as deep as it appears in this stereoscopic view. In 2006, Cassini scientists calculated the tiger stripe fractures like this one to be about 500 meters (1,600 feet) deep, 2 kilometers (one mile) wide and flanked on both sides by 100-meter-high (300-foot-high) ridges. Also, features that appear to overhang others are likely an exaggerated result of the 3-D effect. 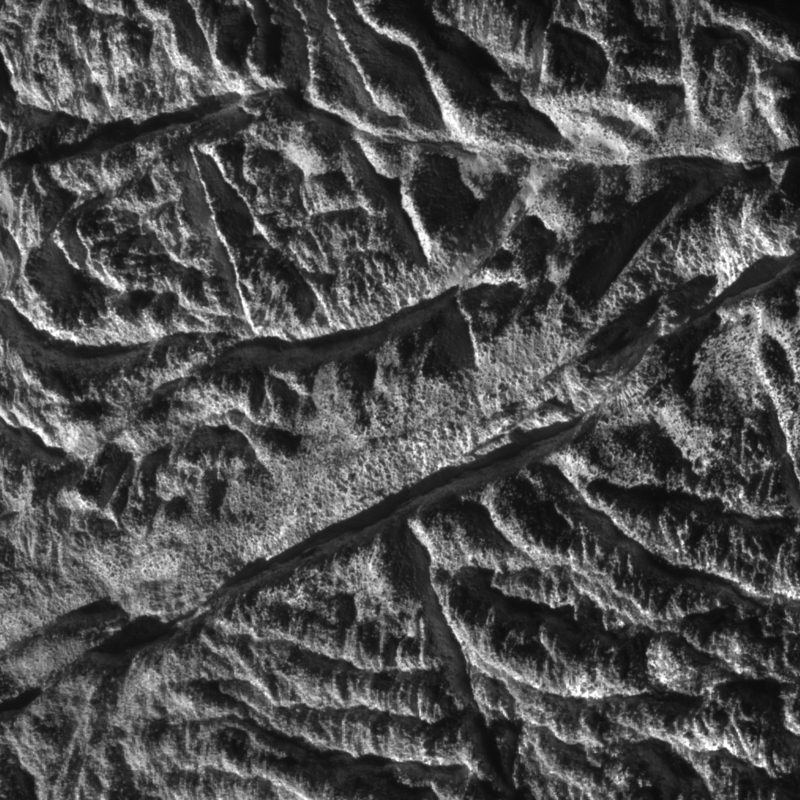 This view looks toward the south pole of Enceladus (504 kilometers, 313 miles across) and it is centered on terrain at 79 degrees south latitude, 24 degrees west longitude. The images were obtained in visible light with the Cassini spacecraft narrow-angle camera on Nov. 21, 2009. It was acquired at a distance of approximately 3,000 kilometers (2,000 miles) from Enceladus and at a sun-Enceladus-spacecraft, or phase, angle of 126 degrees. Image scale is about 12 meters (40 feet) per pixel. The Cassini-Huygens mission is a cooperative project of NASA, the European Space Agency and the Italian Space Agency. The Jet Propulsion Laboratory, a division of the California Institute of Technology in Pasadena, manages the mission for NASA's Science Mission Directorate in Washington. The Cassini orbiter and its two onboard cameras were designed, developed and assembled at JPL. The imaging team is based at the Space Science Institute, Boulder, Colo.